Synthetic peptide conjugated to KLH derived from within residues 1 - 100 of Human Cofilin. Our Abpromise guarantee covers the use of ab42475 in the following tested applications. WB Use a concentration of 1 µg/ml. 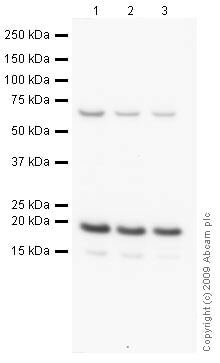 Detects a band of approximately 19 kDa (predicted molecular weight: 19 kDa). Phosphorylated on Ser-3 in resting cells. Nucleus matrix. Cytoplasm > cytoskeleton. Almost completely in nucleus in cells exposed to heat shock or 10% dimethyl sulfoxide. 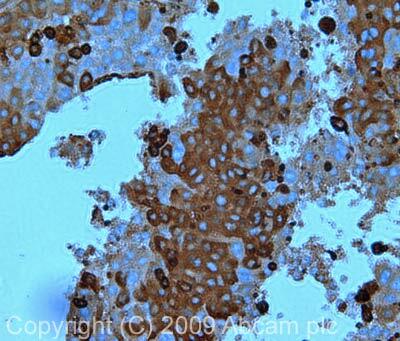 IHC image of Cofilin staining in human liver carcinoma FFPE section, performed on a Leica BondTM system using the standard protocol F. The section was pre-treated using heat mediated antigen retrieval with sodium citrate buffer (pH6, epitope retrieval solution 1) for 20 mins. The section was then incubated with ab42475, 1µg/ml, for 15 mins at room temperature and detected using an HRP conjugated compact polymer system. DAB was used as the chromogen. The section was then counterstained with haematoxylin and mounted with DPX. IHC-FoFr image of Cofilin (ab42475) staining on Rat hippocampus sections. The sections used came from animals perfused fixed with Paraformaldehyde 4%, in phosphate buffer 0.2M. 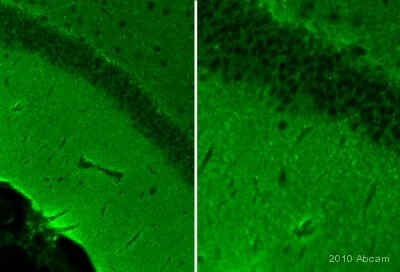 Following postfixation in the same fixative overnight, the brains were cryoprotected in sucrose 30% overnight. Brains were then cut using a cryostat and the immunostainings were performed using the ‘free floating’ technique. ab42475 has not yet been referenced specifically in any publications. Publishing research using ab42475? Please let us know so that we can cite the reference in this datasheet.